Yukon’s Vialok® vented and non-vented vial adapter options give you more flexibility when deciding what the best solution for your pharmacy is. 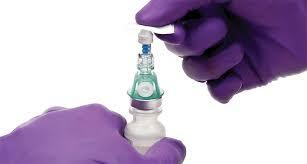 Vented vial access devices can be used on a variety of vials. They feature a .2 micron filter that minimizes aerosols and surface contamination while neutralizing vial pressure. Non-vented vial access devices are a great choice for use on small, low volume vials.